Here in my hometown of Seattle, Washington certain so called sports jocks on sports radio are letting their feeling known on Baltimore Ravens future Hall of Fame member Ray Lewis. And it is getting worse by the day. And in my opinion unfair!! Of course certain clowns like KJR’s Ian Furness and fellow clown Jason Puckett are blasting Lewis and bringing up the 1999 case in which two people were murdered in Atlanta. The murders are unsolved. Some think Lewis was a part of it & he knows what happened and who killed who. But Lewis has “tried” to move on from the case but this situation will follow Lewis until he dies. Furness and others in sports media get behind the microphone and just down right say “I don’t like the guy” And they are tired of “his act” and are tired of his “preaching and dancing”. Which in my opinion is borderline racism. Today I heard a former NFL player say he is tired of Lewis and his “act” and cannot wait until his last game is over. Ian agreed with him. Those comments were BS!!!! Myself, I am not tired of Lewis dancing and his so called “preaching”. Ray Lewis since the case in 1999 has tried to be a first class role model for kids. His record is clean for the last 13 years. He goes to community centers and schools and he talks to the kids about staying in school and etc. He has tried to be a first class role model for milllions of kids all over the world who loves his play off the field and on the field. But the now the media is jumping on a SI story that Lewis may have used a deer spray that might have helped him recover from a serious injury he had during the season. This deer spray is banned by the NFL. Lewis has said the story is not true. So readers what side are you on? I want to know WHY SI came out with this stuff about Lewis ON THE SAME DAY AS MEDIA DAY FOR THE SUPER BOWL???? WHY? Was this planned by SI to make Lewis look bad because he is riding on such a high in helping his team reach the Super Bowl? I say YES!! So now Lewis is fighting the 1999 murder case and the deer spray story instead of discussing the Baltimore Ravens in the Super Bowl vs the 49ers. This is crazy!! Real crazy. 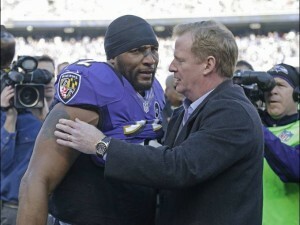 But certains fools like Ian Furness and Randy Cross and others do not like Ray Lewis as a person. They can care less about his Hall of Fame play for 17 years on the field. They want Lewis to suffer. They want to make Lewis look bad just like they wanted Mick Vick and OJ to look bad. I think Ray Lewis is the best linebacker of his day. And one of best of all time in the NFL. When I watch the Super Bowl I want to see Lewis win and go out into retirement a winner. And I want to see him do his dance at the start of the game for the last time. And I want to hear what he wants to say after the game too. Others want to say he is “preaching”. I call it putting down knowledge. This is what I call it. I hope sports radio will get off the 1999 case and this deer spray SET UP by SI and disgame in which one of the best NFL players of all time will play his last game. Hopefully one day the real truth will come out about really happened that day in Atlanta. For everyones sake including the family of the deceased! Is SI trying to sell magazines with this Lewis story put out on press day at the Super Bowl? HELL YESSSSS!!! !